I came across the Bronte Cinema, Haworth, by accident on my way down the hill to the steam-railway station last summer. It stands on the side of the Worth Valley that doesn’t celebrate the Brontë sisters and so doesn’t attract visitors. A helpful local contact put me in touch with the owner, Mr Robert Snowden, who welcomed me and allowed me to photograph the remarkably intact interior. There is very little information online about the building, and what little there is turns out to be inaccurate. The exterior has a curved balustrade decorated with stone balls, built in the dour local stone. The corner to the north of the entrance was a shop, for many years selling sweets, later Miss Betty Dawson’s hairdresser’s and then Mr Pickles’ shoe-repairer’s. Because the site is steeply graded the proscenium is at the front of the building, and the operating box is located beneath the balcony. Inside, the balcony and proscenium remain intact. Eddie Kelly, an assiduous local historian, generously provided me with material from his research, and another historian, Steven Wood, pointed out that the original plans are preserved at Keighley Local Studies Library. The Bronte Cinema opened on April 21st 1923 with a concert by the Bocking Male Voice Choir and the Haworth Public Prize Band in aid of local hospitals. Neither the Bronte nor the rival Hippodrome cinema bothered much with press advertising so information about film performance is patchy, but the Bronte’s opening-week advertisement for Mr Wu with Matheson Lang (1919) describes the place as “the cinema of distinction – the finest appointed cinema in the West Riding”. From the outset the Bronte served as a cultural centre for the town: two hundred people were turned away from a concert by the amateur LEO Orchestra & Society because the 778-seat auditorium was full half an hour before the start-time. For years it was the venue for six-day productions by the Haworth Operatic Society. In later years the Bronte provided three different films each week, Monday-Tuesday, Wednesday-Thursday and Friday-Saturday. My friend Marjorie remembers as a teenager clutching her mates’ hands on the balcony during a particularly horrific horror film, sometime towards the end of the War. There’s no record of when the Bronte converted to sound movies, and the cinema historian Ken Roe has found no evidence that it was ever adapted to show wide-screen films. It closed on July 28th 1956, with Danny Kaye’s On the Riviera, apparently because of competition from television and also “the bad condition of Victoria Road”. In November 1957 the building and contents were put up for auction, but the building was withdrawn when the highest offer was £1,000. Mr Snowden told me he bought it in 1961 for £3,000 and ever since has operated his non-ferrous scrap business there. He has now wound down his business in preparation for his imminent retirement and the building is up for sale. Mr Snowden is adamant that he doesn’t want to see it demolished: he says it’s a substantial, weather-tight structure that has needed very little maintenance over the past fifty-odd years. The most radical alteration has been the removal of the entrance steps to create vehicle access to the raked floor of the stalls. Schemes to convert the Bronte Cinema to residential use date back to 1993, but Mr Snowden says he’d prefer to see it put to some kind of heritage purpose. Understandably, he needs to find the best possible price for his asset. It’s one of the unlisted, largely unaltered historic buildings that could easily disappear, yet the elaborate plasterwork and woodwork of the 1923 design survive beneath a patina of thirty years of nicotine and over fifty years of industrial dust. While Friends groups work to revive such places as the Derby Hippodrome Theatre, where an unkind previous owner removed much of the roof, and the Doncaster Grand Theatre, where the owner and the borough council are alike unsympathetic to restoration efforts, a delightful but unkempt building like the Bronte Cinema deserves the chance of a future. This entry was posted in Fun Palaces on December 14, 2016 by Mike Higginbottom. On its course towards Lady’s Bridge in the centre of Sheffield, the River Don splits: water is taken from the natural course and sent down a mill race, originally built for the town’s medieval corn mill, creating an artificial island that was later named after the town armourer, Kellam Homer, who worked here just before the Civil War. It has always been an intensively industrial spot, its furnaces, forges and workshops initially powered by water, later by steam. 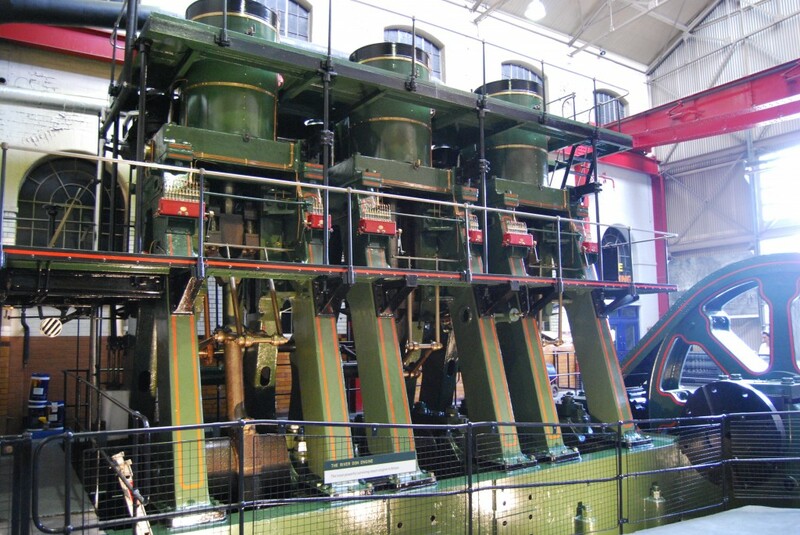 When Sheffield’s tramways were first electrified in 1899, the Corporation power station was located at Kelham Island, and its buildings now form the Kelham Island Industrial Museum, opened in 1972, telling the story of Sheffield’s industries through displays and exhibits, supplementing the historic sites at Abbeydale Industrial Hamlet and Shepherd Wheel. The displays highlight the continuing variety of Sheffield manufactures, from cutlery to liquorice allsorts, exhibiting the fast-disappearing skills of the “little mesters”, and providing a home for England’s largest surviving Bessemer Converter, a working Crossley Gas Engine and the mighty 400-ton, 12,000hp River Don Engine, built by the Sheffield firm of Davy Brothers to roll armour-plate up to fifteen inches thick. It’s also the home of the Ken Hawley Collection, the result of a lifetime’s assiduous acquisition of tools, archives and moving-image records that saved for posterity the vanishing crafts of the “little mesters” and the larger engineering firms that have disappeared since the Second World War. Ken Hawley MBE (1927-2014) accumulated irreplaceable artefacts through his business connections in the tool trade, and by enlisting historians and engineering enthusiasts over six decades. Kelham Island is now famous for its beer. The Fat Cat public house, with its Kelham Island Brewery, is within sight of the museum, and around the corner is the Kelham Island Tavern, a similarly celebrated home of real ale. 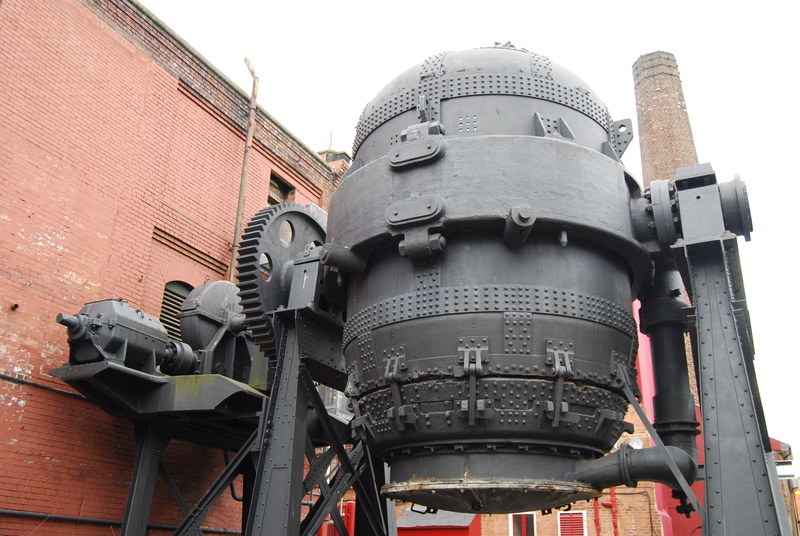 The Kelham Island Industrial Museum is a destination in the itinerary of the Sheffield’s Heritage (October 2nd-6th 2017) tour. For details, please click here. This entry was posted in Sheffield's Heritage on December 4, 2016 by Mike Higginbottom.